Broadway, the main street that runs through Robert Pinsky’s home town of Long Branch, New Jersey, was once like thousands of other main streets in small towns across the country. 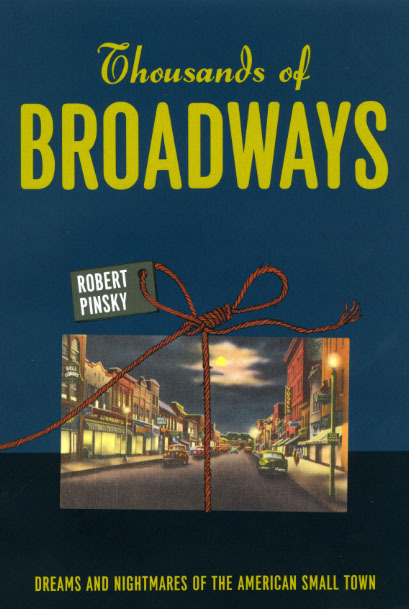 But for Pinsky, one of America’s most admired poets and its former Poet Laureate, this Broadway is the point of departure for a lively journey through the small towns of the American imagination. Thousands of Broadways explores the dreams and nightmares of such small towns—their welcoming yet suffocating, warm yet prejudicial character during their heyday, from the early nineteenth century through World War II. The citizens of quintessential small towns know one another extensively and even intimately, but fail to recognize the geniuses and criminal minds in their midst. Bringing the works of such figures as Mark Twain, William Faulkner, Alfred Hitchcock, Thornton Wilder, Willa Cather, and Preston Sturges to bear on this paradox, as well as reflections on his own time growing up in a small town, Pinsky explores how such imperfect knowledge shields communities from the anonymity and alienation of modern life. Along the way, he also considers how small towns can be small minded—in some cases viciously judgmental and oppressively provincial. Ultimately, Pinsky examines the uneasy regard that creative talents like him often have toward the small towns that either nurtured or thwarted their artistic impulses. Of living in a small town, Sherwood Anderson once wrote that "the sensation is one never to be forgotten. On all sides are ghosts, not of the dead, but of living people." Passionate, lyrical, and intensely moving, Thousands of Broadways is a rich exploration of this crucial theme in American literature by one of its most distinguished figures. "Pinsky offers a provocative take on the relationship between artists and small-town America. He explicates quotations from Cather, Faulkner and Twain, as well as scenes from filmmakers like Hitchcock and Sturges, and reminiscences about his own upbringing in Long Branch, N.J."
"Interspersed with his recollections are deft analyses of fictional small-town portrayals. . . . Pinsky’s eloquent reflections on collective memory and hypocrisy are well worth absorbing."